Get The Custom Garage You’ve Always Wanted! Welcome to Custom Garage Works! We are a company dedicated to creating dream garages for our clients in DFW and surrounding areas. We started our company in 2003, when we wanted to upgrade our own garages, but couldn’t find the level of quality we were looking for. We wanted more, and since we couldn’t find it, we decided to make it. We spoke with manufacturers inside and outside of the industry until we gathered enough information to make the ultimate garage. Now, we offer our services to other enthusiasts like ourselves, who want more out of their garages. When you need a custom garage in Haslet and Fort Worth, TX, give us a call at 214-494-9068 or 817-308-1305! Whether you want a simple floor coating or a complete garage organization service, our professionals are here to help. 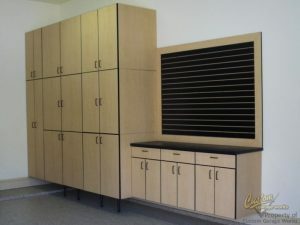 Storage Solutions From cabinets, to slat walls, to overhead racks, we have the storage solutions your garage needs! Floor Coatings Our floor coatings are designed to withstand dropped tools, oil spills, and more! Car & Auto Lifts Running out of room for your cars? Not anymore, with a car lift from Custom Garage Works! Out of all of our garage services, floor coatings are likely the most sought after option. Many of our clients come to us after purchasing failing epoxy floors from low-budget garage floor contractors. If you are looking for a new garage floor, skip the low budget epoxy. Those systems have been known to fail in as little as a few months. 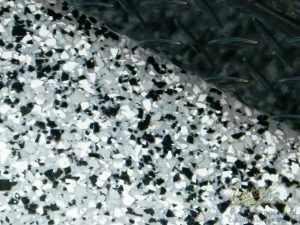 At Custom Garage Works, we offer several floor treatments, but our most highly recommended floor coatings are our polyurea polyaspartic garage floor coatings. We carry floor coatings in a wide selection of styles, and we provide options for texturing as well. 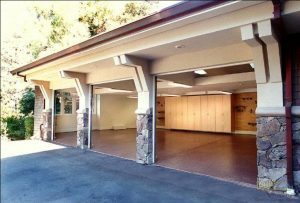 Depending on how you use your garage, you can work directly with one of our contractors to determine the best option for your garage floors. We stand by the quality of our work, and we want you to have a floor you will adore for a lifetime. Our coatings stand up to UV rays, and are resistant to hot tire pick-up too! If you are looking for the ultimate custom garage experience, polyaspartic coatings won’t let you down. As for storage options, we’ve got solutions in all shapes and sizes. From custom cabinets designed to hold over 1000 pounds, to faux doors that can cover unsightly water heaters and circuit panels without restricting access, we can help you with it all. We also offer car lifts for our car enthusiasts and overhead storage and wall storage options for effective organization. All of our storage solutions offer complete customization to fit your specific needs and primary uses. At Custom Garage Works, our job isn’t done until you are completely satisfied. We want our clients to enjoy their garages as much as we enjoy our own. No matter what you use your garage for, we have options that can help you make your garage a more pleasant environment to spend time in. When you want the most value for your dollar on a custom garage in Haslet and Fort Worth, TX, give us a call at 214-494-9068 or 817-308-1305 for your free estimate. We have years of experience and plenty of references for you to see. Check out our reviews, and our rating with Angie’s List. Your ultimate garage is only a phone call away!